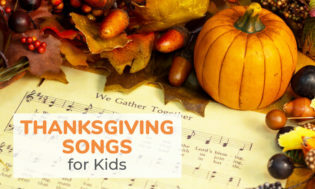 Find a collection of classic Thanksgiving songs and poems for kids. These are great to use in the classroom and get the kids in the holiday spirit. 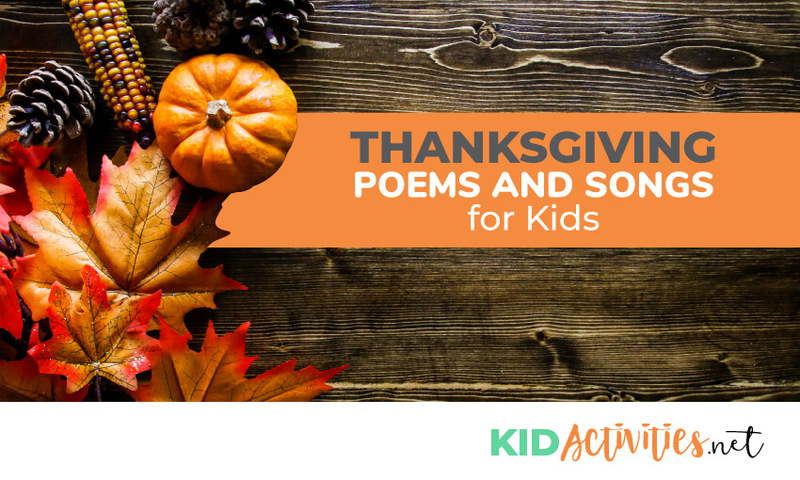 Have the children write or dictate their own recipes for a Thanksgiving feast. Write each recipe on a large index card and ask them to illustrate their recipes. Then mount the recipe cards below the pictures. Give each child a clip-art decorated page and have them write or dictate their favorite recipe (from their perspective) and compile all into a “center cook book”. You will come out with a very humorous book! You could also put the recipes together and make a “Class Book” to display at your parents’ center. Ask each child to bring a favorite “real” Thanksgiving Family recipe from home. Compile all and make a cookbook for each family! This would be really cute for your November Newsletter (October if you live in Canada) or posted at your ‘Info Center’. It could also be said at your Turkey-Day table!!! One saw some corn, and then there were four. Run, Run, Run far away. Soon it will be Thanksgiving Day! One fell down and then there were three. A dog chased one and then there were two. The wind came along and then there was one. 1 little turkey saw a farmer come; He ran far away and then there were NONE! One waddled off,and then there were three. Love this idea from lilteacher… DISGUISED TURKEYS! Children took home a copy of a plain turkey. The fun was to disguise the turkey in a creative manner! 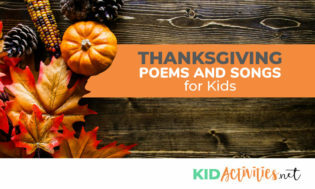 If you’re concerned that parents in your program are in the mist of time-challenge constraints–form groups of 2 to 4 children to come up with their own version of a “Disguised Turkey”! Create a wonderful display with their vision! Put names of the ‘Turkey” under the creations. Example: Gramma Turkey, Santa Turkey, Superman, etc. TURKEY QUIZ & DISCUSSION–HOW MUCH DO YOU KNOW? 1. What is a male turkey called? 2. What is female turkey called? 3. What is a baby turkey called? 4. Where will you find the turkey’s wattle? 5. What is a Gizzard? 6. Where and what are the turkey’s caruncles? 7. Where is the turkey’s snood? 9. How many babies do turkeys have? 1. A male turkey is called a Tom or a Gobbler. When the poults hatch, they flock with their mother all year including the winter). 4. A Wattle is the flap of skin under the turkey’s chin. It turns bright red when the turkey is upset or during courtship. 5. A Gizzard is part of a bird’s stomach that contains tiny stones. It helps them grind up food for digestion. 6. The caruncle is the growth of skin that dangle from the turkey’s chin–the throat region. It turns bright red when the turkey is upset or during courtship. 7. The snood is the growth of skin that droops over the gobbler’s bill. (The flap of skin that hangs over the turkey’s beak) It turns bright red when the turkey is upset or during courtship. 8. Wild turkeys are about 3 to 4 feet tall. The male turkey weighs between 16 and 24 pounds and the female is smaller and only weighs between eight and 10 pounds. 9. A turkey hen lays an average of eight to 17 eggs. She lays them one at a time in a nest built on the ground. After several weeks when all the eggs have been laid, she begins to sit on them to incubate, or keep them warm. After 28 days the eggs are ready to hatch. Wild turkeys can run fast—up to 25 miles per hour. They can also fly up to 50 miles per hour. In the right conditions (still and quiet), a turkey’s gobble can be heard up to one mile away! Check out the Category with Thanksgiving Jokes! Turkey, sweet potatoes, vegetables, applesauce, pies, fruits, etc. 2.) Estimate the amounts you will need and put out a sign-up sheet with how much you’ll need. 3.) Parents then sign up for their choice. Be sure to tell them to bring their contribution ready to go and serve! Have the center provide juice, water, sturdy plates, napkins and utensils. 4.) Time is short for us all; however, there are so many good food stores that make excellent turkey breast, chicken pieces, potatoes, fruit, etc. Tell families their contribution does not need to be home-made! 5.) For the feast, have children make THEMED-PLACE MATS and decorations the weeks before the event! Give all a role in the fun celebration! Great twist of the classic – I Know an Old Lady Who Swallowed a Fly. I know an old lady who swallowed a pie, a Thanksgiving pie, which was really too dry. And with that the feast begins! After the pie the old lady swallows a whole squash, all of the salad, and the entire turkey! As Mother and Father watch in shock, the two children are delighted to see the old lady growing fatter and fatter. And, in the end, the old lady makes a surprising and humorous contribution to the holiday festivities. In November, the air grows cold and the earth and all of its creatures prepare for winter. Animals seek food and shelter. And people gather together to celebrate their blessings with family and friends. This book is a great resource to share at Thanksgiving time, as it honors family traditions of this seasonal month. A creative spin on the Clement C. Moore classic, The Night Before Thanksgiving is a warm, whimsical celebration of everyone’s favorite fun-filled, family-filled, food-filled holiday! Follow along as the feast is prepared, cousins are greeted, and thanks are given, all with an extra helping of holiday fun.